The book makes two parallel arguments. First, Dawson argues that religion is, and should be treated as, a separate category of human experience. 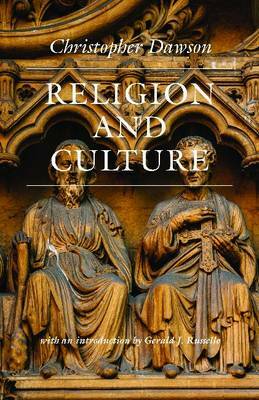 Second, Dawson claims that religion has a unique place in human culture and has defined and developed different cultures in identifiable ways. Without understanding both premises, he argues, one cannot understand cultural development. Drawing on his profound and sympathetic reading in anthropology, sociology, comparative religion and the literatures of Western and non-Western cultures, Dawson seeks to bridge the gap between religion and the sciences through the tradition of natural theology. His approach respects the natural sciences and their power to plumb the mysteries of the natural world, while recognising that they cannot, alone, explain religious intimations of the transcendent. Religion and Culture was written and published in a time not unlike our own, when the very distinctiveness of religious experience has been denigrated, and religious belief is considered in some circles as an atavistic holdover. And yet, the existence of a purely technocratic culture and its ability to embody and transmit moral or cultural norms remains in doubt. Dawson, who in his day was respected well outside Catholic circles, is an important voice in this continuing debate.